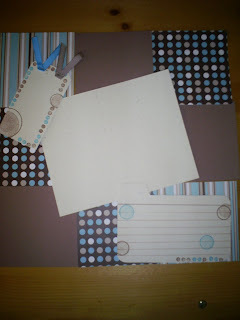 These are 2 mini scrapbooking kits I made for a swap that I in in my scrapbooking group. 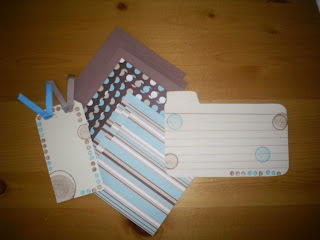 Each kit includes 9 - 3.5" x 3.5" squares of pattern and plain paper, a tag, and journal box. There are brads and eyelets too, but I didn't include them in the pictures. For this one, I used browns with a hint of turquoise. The journal box is on confetti cream cardstock. I traced an index card divider and added lines. Then I stamped it with circles using brown and turquoise ink. The tag is done similarly and I stapled the ribbon to the top of the tag. This set is pretty much the same just using greens and reds instead. There are lines on the index card journal box, but they aren't really showing up in the pictures. The red ribbon is stapled to the tag. I made doubles of these, so I could have a set of each to work with. I think this is how I will use them in my Little Sweetie's album. 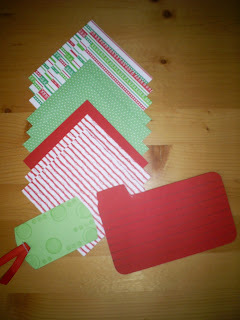 The large pieces of cardstock (red/beige)in the middle of the layouts is for matting the picture. 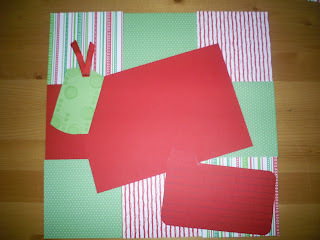 Posted by Lisa at 3:00 p.m.
How fun, to being part of a scrapbooking swap club. I've heard about knitting and crochet swap clubs but this is the first I've heard of this. I just love the blogging world. These swap groups are a great way to 'put a face' on your blogging pals. February 23, 2007 at 1:59 p.m.
Scrapbooking is not something I am good at doing, but I sure do enjoy looking at other's creations! Fortunately for me, my sister is a scrapbooker, and has made books for my children. February 24, 2007 at 11:25 p.m.
Wow, that sounds like a neat idea, being able to swap some of your creations. Thanks for sharing. I'm with Ann, I enjoying seeing what other people work on. ;0) It is inspiring. March 4, 2007 at 5:51 p.m.
March 5, 2007 at 11:49 p.m.